Andreas Mogensen finished secondary school in Copenhagen, Denmark in 1995, graduating with an International Baccalaureate from the Copenhagen International School. He received a masters degree in aeronautical engineering from Imperial College London in the UK in 1999. As part of his studies, he spent a semester at the Instituto Superior Tecnico in Lisbon, Portugal. Andreas Mogensen received a doctorate in aerospace engineering from the University of Texas at Austin in the United States in 2007. His research interests include guidance, navigation and control of spacecraft during entry, descent and landing; mission analysis and design; and trajectory optimisation. Andreas Mogensen began his professional career as an engineer at Schlumberger Oilfield Services, where he worked as a drilling services engineer from 2000 to 2001. He was stationed in the Republic of Congo and the Republic of Angola working on offshore oil rigs. From 2001 to 2003, Andreas Mogensen worked at Vestas Wind Systems in Ringkøbing, Denmark, as a control systems engineer in the research and development department, where he designed control systems for wind turbines. From 2004 to 2007, while working towards his doctorate, Andreas Mogensen was a research assistant at the Center for Space Research and a teaching assistant in the Department of Aerospace Engineering at the University of Texas at Austin, USA. From 2007 to 2008, Andreas worked as attitude and orbit control systems engineer for HE Space Operations. He was subcontracted to Airbus in Friedrichshafen, Germany, for the duration of his employment, where he worked on ESAs Swarm mission. Before being selected as an astronaut in 2009, Andreas was a research fellow at the Surrey Space Centre at the University of Surrey in the UK. His research focused on spacecraft guidance, navigation and control during entry, descent and landing for lunar missions. Alongside his astronaut duties, Andreas Mogensen is also currently an adjunct lecturer at the National Space Institute at the Technical University of Denmark (DTU Space). 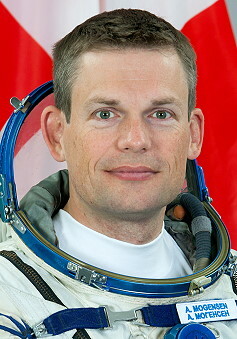 Andreas Mogensen was selected as an ESA astronaut in May 2009 and completed the astronaut basic training programme at the European Astronaut Centre in Cologne, Germany in November 2010. Since completing the astronaut basic training programme, Andreas Mogensen has been trained and certified as a private pilot by the Lufthansa flight school and is trained and qualified for spacewalks using both the American EMU spacesuit and the Russian Orlan suit. Andreas Mogensen participated in the 2012 ESA CAVES underground training course, as part of an international team of six astronauts, living underground for a week and exploring a cave system in Sardinia. The ESA CAVES training is a space-mission analogue, focusing on human behaviour and performance in extreme environments. Andreas Mogensen was also selected as a crewmember in two NASA Extreme Environment Mission Operations (NEEMO) missions. He participated in the NEEMO 17 mission (also called SEATEST 2) in September 2013 and in the NEEMO 19 mission in September 2014. Both missions took place at the Aquarius undersea research laboratory, off the coast of Florida, USA, as an analogue for space exploration missions. In addition to his astronaut training activities, Andreas Mogensen worked on the engineering team for the ESA Lunar Lander mission at ESAs technical heart, ESTEC, in the Netherlands, where he was involved in the design of the guidance, navigation and control system for precision landing. Andreas Mogensen is a qualified Eurocom at the Columbus Control Centre in Munich, where he communicates with the astronauts on the International Space Station. Andreas Mogensen enjoys rugby, basketball, and squash. He is also active in several adventure sports, including scuba diving, skydiving, kite surfing, kayaking and mountaineering. Other interests include science, in particular astrophysics, exobiology, and evolution.